Hier een klein deel van onze kerstcollectie. Sfeer met Steiff in deze bijzondere tijd. 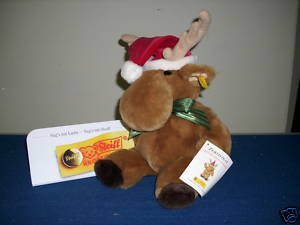 Schitterende cadeau's voor Sint of Kerst. Reserveer of bestel tijdig! 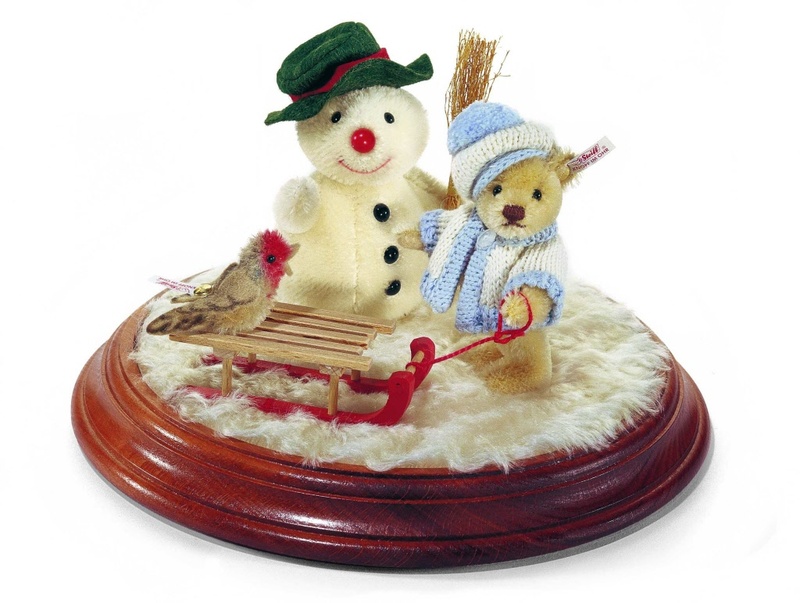 2006 Steiff EAN 038273 Winter Diorama, doorsnede 24cm. Items 4, 9 en 10 cm. Uit 2006 schattig winterschouwspel. Teddy 9 cm, sneeuwpop 10 cm. Nu van €259,00 voor € 149,00. 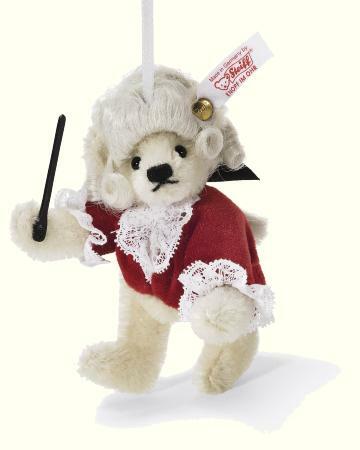 2006 Steiff EAN 656392 Mozart Teddy Ornament, 9cm. Limited edition of 2006 pieces. Kleine Mozart als ornament. Compleet met pruik en dirigentstok. Hij komt met doos en certificaat. Little Mozart Christmas ornament. He wears a lovely wig. He comes with box and certificate. Kersteland met mooie kerstmuts en groene strik. Speciale uitgifte voor Japan. Zij komt met certificaat en houten kist. 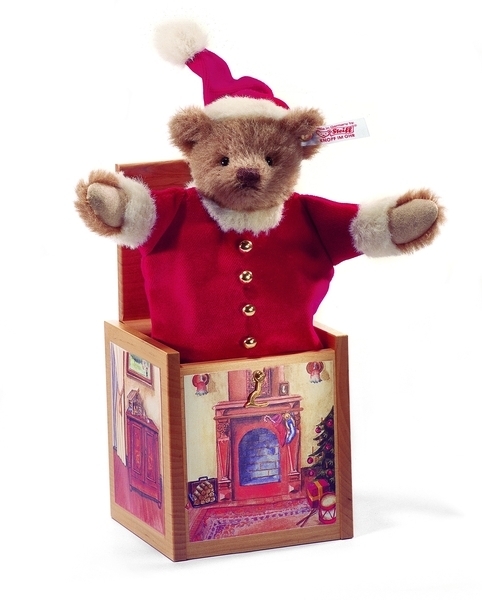 2007 Steiff EAN 038419 Santa in the box, 23cm. Deze teddy van alpaca met muts en jas van fluweel is altijd in voor een grapje. Geinspireerd op de "Jack in de Box" of te wel Het duveltje in het doosje, verrast deze teddy de opener van het houten doosje ook door tevoorschijn te springen. Santa in the box is compleet met doos en certificaat. 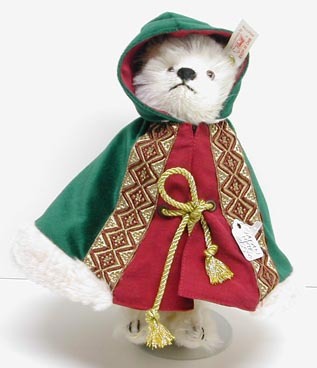 This Christmas Teddy bear made of alpaca and wearing a bobble hat and coat made of fine velvet with golden buttons is always good for a surprise. 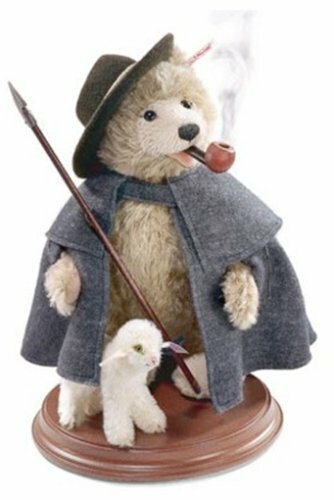 The Steiff Teddy was inspired by the classic "Jack-in-the-Box", who has been delighting children and adults in England and the USA with his irrepressible spirit for centuries now. When the proud owner opens the alder wood box, the Teddy bear who is fitted with a spring, jumps up with his arms stretched out wide. The wooden box is decorated with lovingly drawn pictures of a home decorated for Christmas. The Steiff logo decorates the lid. The Santa in the Box, is 23 cm in size and limited to 1500 pieces. The Santa comes in a box with certificate of authenticity. 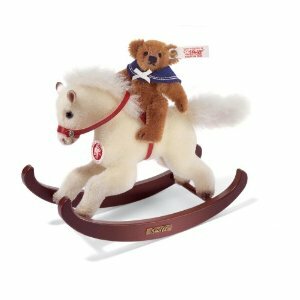 2007 Steiff EAN 037337 Teddybear with rocking horse, 16cm (paardje) 9cm (teddy). Mohair teddy with rocking horse is gemaakt van bruin mohair en 9cm. Het hobbelpaard is van wit mohair en is 16cm hoog. Hij komt in doos met certificaat. The Mohair Teddy bear with rocking horse is limited to 1500 pieces. The Teddy bear, is made from brown mohair, jointed and 8 cm in size. The rocking horse, made from white mohair and 16 cm in size.Teddy has a stylish sailor's collar made of blue felt and embroidered with the words "MS Steiff". This set comes in a box with certificate of authenticity. 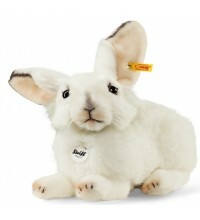 Steiff EAN077968 Niklas Artic Hare, 32cm. 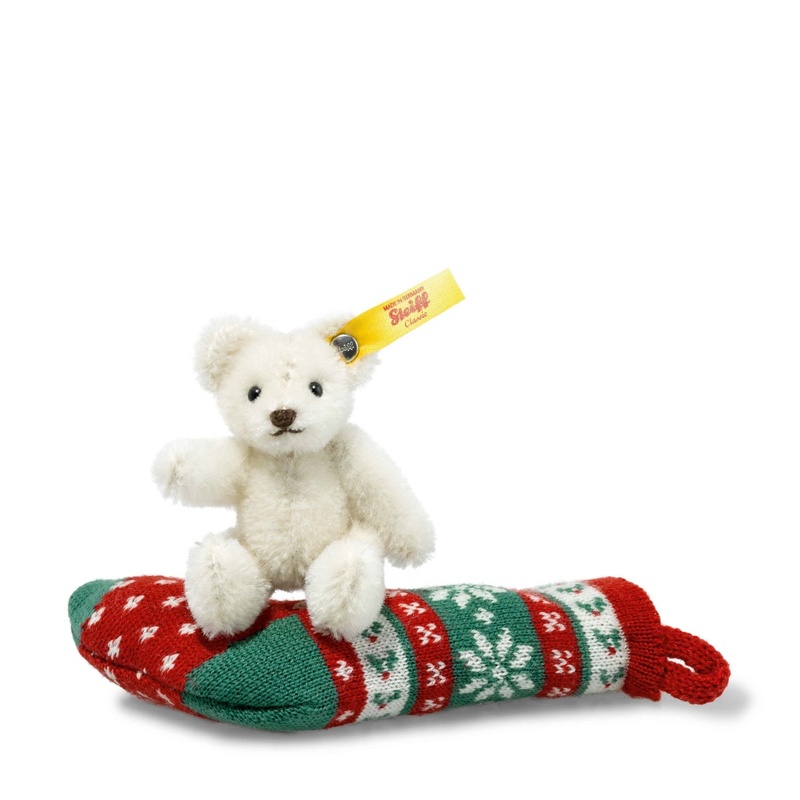 Steiff EAN 026751 Teddy with stocking, 15cm. 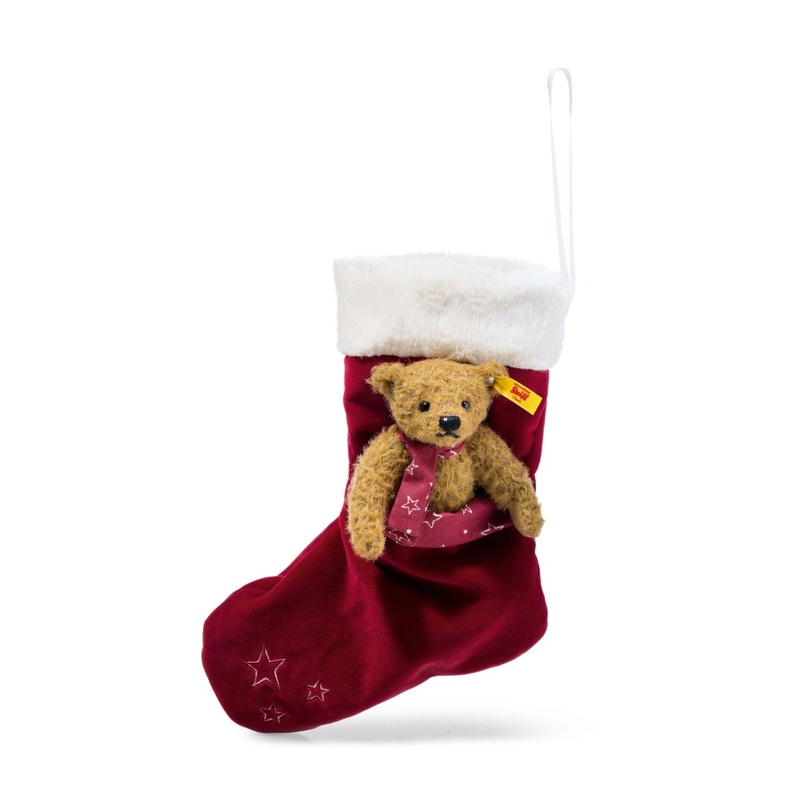 Teddy with plush Christmas Stocking is made out of russet mohair. He has a hand embroidered nose, safety eyes and is stuffed with synthetic fillings. The surface is washable. He has a button in his ear. 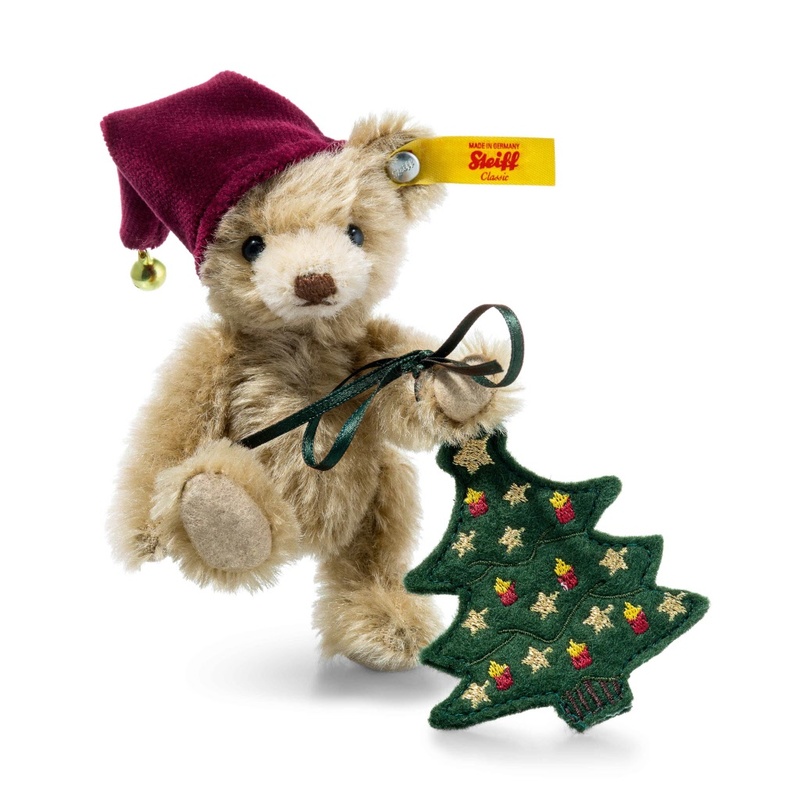 Steiff EAN 026782 Teddy Nic with Christmas tree, 11cm. 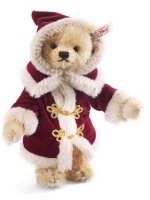 Teddy Nic with Chrismastree is made out of cinnamon mohair. He has a hand embroidered nose, safety eyes and is stuffed with synthetic fillings. The surface is washable. The tree is made of felt. 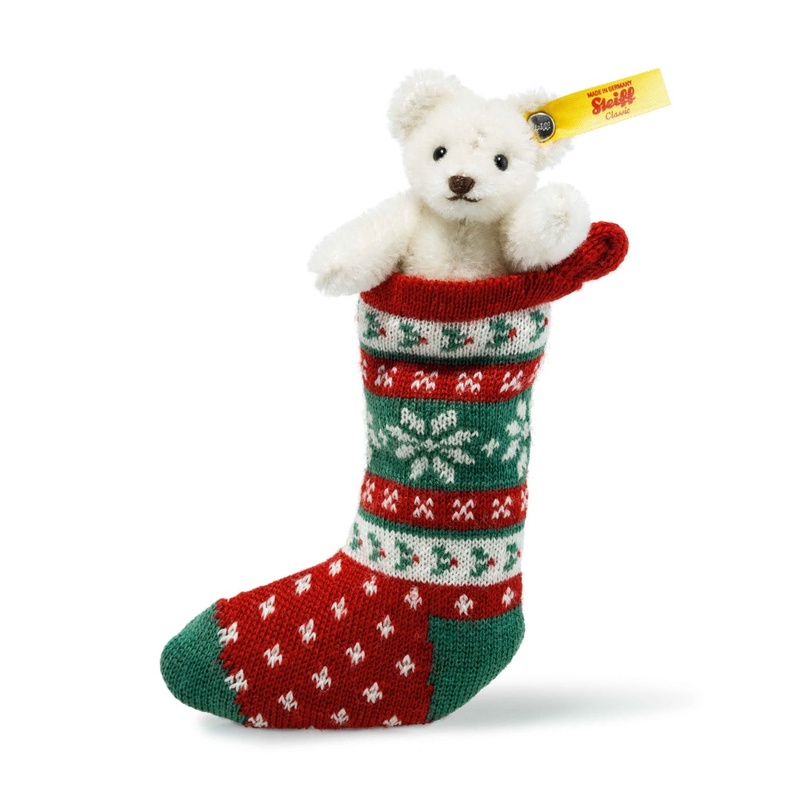 Steiff EAN 026768 Mini Teddy bear in stocking white, 8cm. 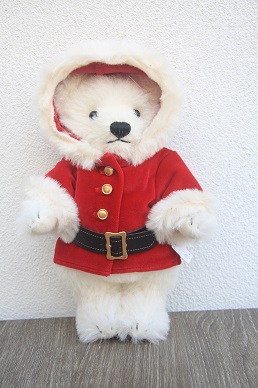 Teddy in tricot stocking is made out of white mohair. He has a hand embroidered nose, safety eyes and is stuffed with synthetic fillings. The surface is washable. 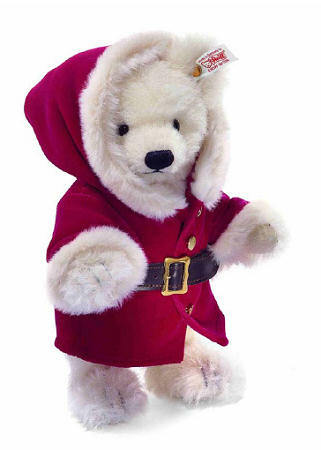 Steiff EAN 026775 Mini teddy beer in stocking russet, 8cm. 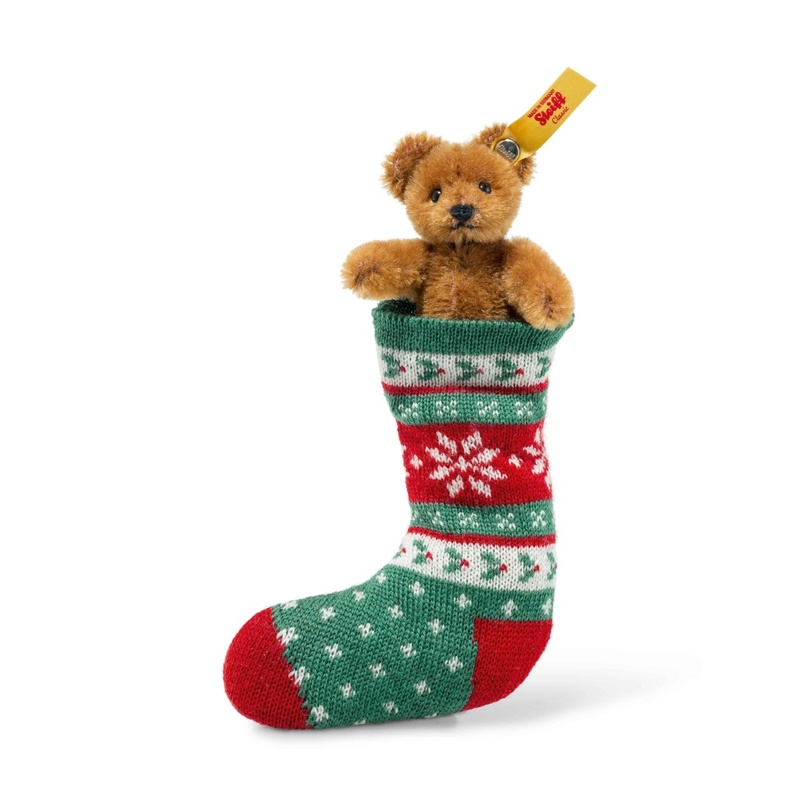 Teddy in tricot stocking is made out of russet mohair. He has a hand embroidered nose, safety eyes and is stuffed with synthetic fillings. The surface is washable. 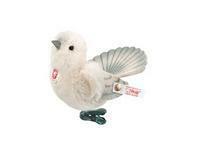 Steiff EAN 039553 Keyring pendant Raphael guardian angel teddy, 11cm. Raphael Guardian Angel is made out of ice blue mohair with wings. He is filled with synthetic filling material, has safety eyes and is fully jointed. 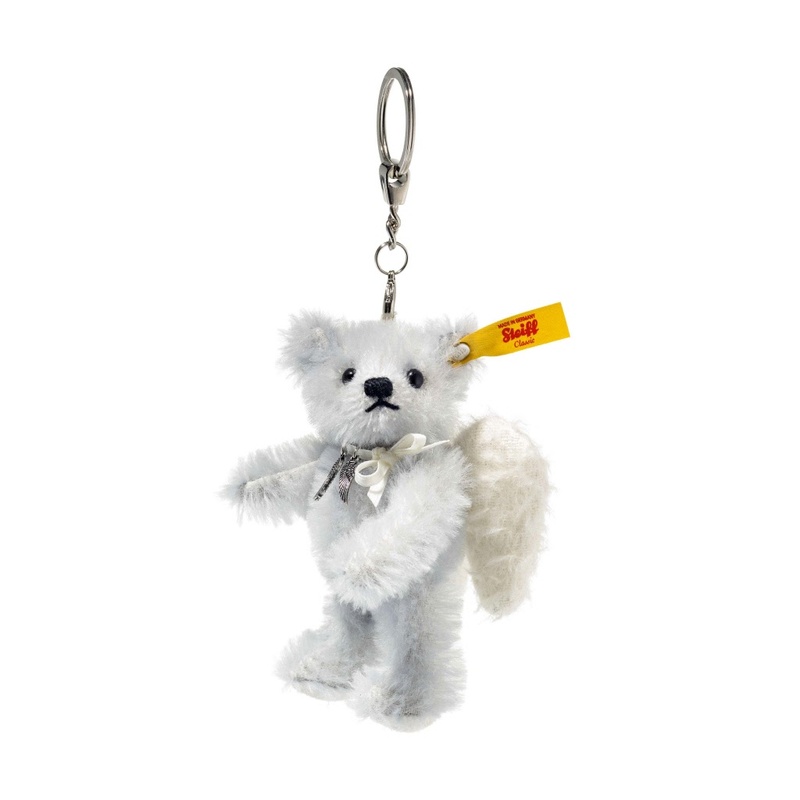 A mohair Steiff keyring/pendant is not a toy and is intended for adult collectors only. Raphael has the famous trade-mark button in ear.